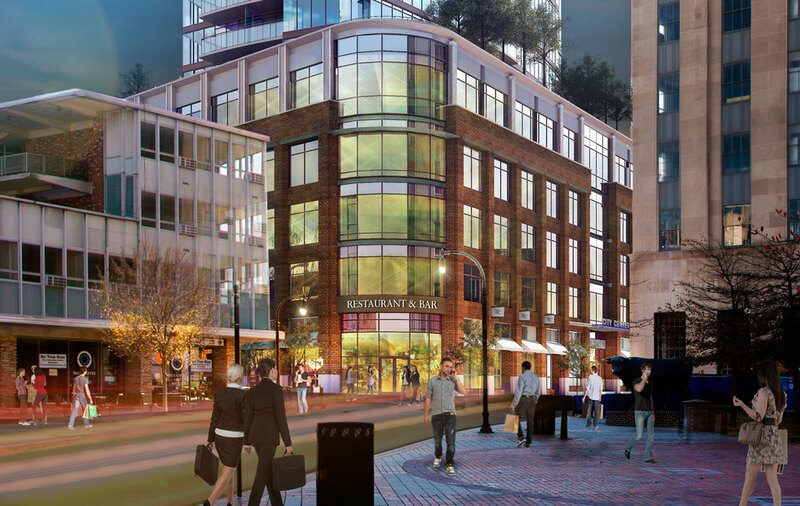 By adding 22,828 square feet of street-level retail space in the heart of Downtown Durham, ONE CITY CENTER will enhance the city experience with a variety of shopping and dining options. Surrounded by Corcoran, Parrish and Main Streets, less than a mile from the freeway, the available retail space will be strategically located to cater to the growing needs of the downtown workforce, its residents, and visitors alike. Durham's ONE CITY CENTER will be the heartbeat of Bull City's creative, financial, lodging and entertainment district – an ideal location for restaurants and retailers with excellent daytime and evening traffic. Retail space at ONE CITY CENTER will feature 22,828 rentable square feet of retail with more than half of the available suites featuring reconstructed historic façade storefronts. ONE CITY CENTER is located on a historic site, surrounded by successful adaptive reuse and development projects such as the American Tobacco Historic District, West Village, the Durham Performing Arts Center and the Durham Bulls Athletic Park, to name a few. It is also at the epicenter of ongoing and planned development projects that all contribute to downtown’s revitalization. The revitalization of Downtown Durham has translated into trendy bars and unique shops emerging at a fascinating rate. ONE CITY CENTER will soon join the movement, adding retail space in a sought-after location. ONE CITY CENTER is located in the heart of Downtown Durham on a historic site bounded by Corcoran, Parrish and Main Streets. The property is surrounded by successful adaptive reuse and development projects such as the American Tobacco Historic District, West Village, the Durham Performing Arts Center and the Durham Bulls Athletic Park, to name a few. It is also at the epicenter of ongoing and planned development projects, including the 21c Museum Hotel, Aloft Hotel, Unscripted Durham, Hotel Durham, and five apartment communities totaling more than 1,100 new units. Want to offer a unique work environment to your employees? We welcome inquiries. Or, complete the form below. We look forward to speaking with you!